I know, I know. You're still just trying to plan your Thanksgiving menu and haven't even thought about what to do with the leftovers. But planning ahead is vital to a healthy lifestyle! 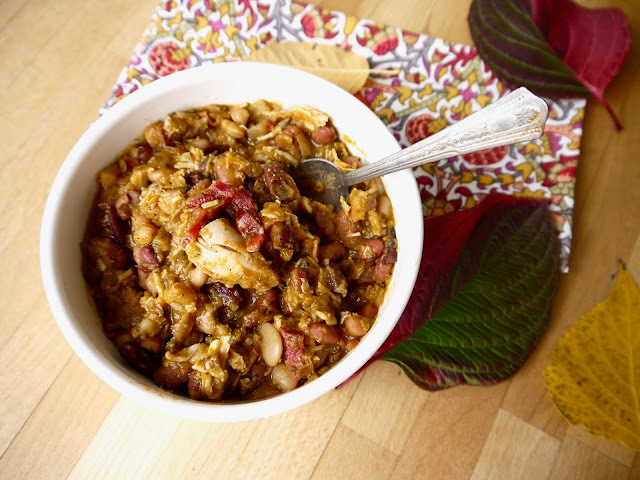 This delicious soup is the perfect place for your turkey leftovers. It's super filling with all of the protein and fiber. The yams actually *dissolve* creating a sweet and thick broth. You'll thank me on Friday. In a crock pot or slow cooker, combine all ingredients except for turkey and bacon. Cook on high for 5 hours. After 5 hours reduce the temperature to low and add turkey. Cook bacon and crumble into small pieces. Serve soup topped with one slice of crumbed bacon.